The temperature has risen across the southeastern United States and so has the water in your rain gauge in many areas. For cattle producers this brings on much needed summer forages, hay production, and time to evaluate their cattle after a mild spring. This time of year also brings on one of the most common nuisance for cattle in flies. Pest flies are attracted to cattle as a source of feeding, primarily in the form of blood. Face Flies, Musca autumnalis, are robust flies that resembles the common house fly. It is non-biting and feeds on the mucus and secretions around the animal’s eye. An abundant number of flies can usually generate excess mucus secretions from the eyes compounding the problem. 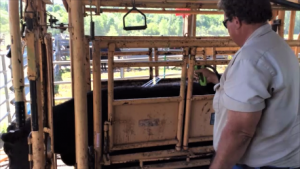 One primary concern with the face fly is that it can spread the bacterium Moraxella bovis that causes pinkeye in cattle. Horn Flies, Haematobia iritans, are slightly smaller than the face fly or stable fly. These are blood-sucking pests with both sexes having piercing mouthparts they use to penetrate the cows skin to obtain blood meals. Horn flies will usually remain on the cow only relocating when disturbed or going to lay eggs on fresh manure. Common locations for the flies to land are on the sides of the cow behind the shoulders or directly on the back depending on length of hair. Horse flies, Tabanus spp, are painfull, blood sucking pests that cause extreme irritation to cattle. Interestingly, only the adult female bites. They are generally daytime feeders that use piercing/chewing mouth pieces to feed on the blood of the animal. Horse flies will sometimes move from animal to animal until they can locate an area where they will be least disturbed. This makes horse flies the most difficult to control of the three. Due to their intermittent feeding activity, they are prone to spread of disease, most notably anaplasmosis, a blood-disease that can cause abortions and death in cattle. Adult flies can take up 20-30 bloodmeals a day. This can result in the animal losing up to a pint of blood a day. Flies interrupt grazing and can reduce weight gain by 17-33% over an 80-day period. This is especially seen in growing calves that have over 200 flies as their weaning weights can be up to 15 pounds lighter. Flies in these large populations can lead to a devastating loss of profit. Up to $68/head can be lost due to overpopulation of flies. This can also total $1 billion of income loss over the entire United States. No producer wants to lose money, let alone when there is a solution to the problem. 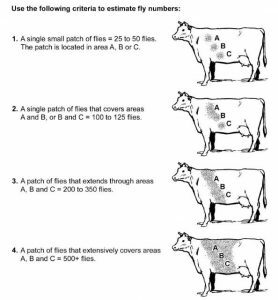 It has been determined that the economic threshold for flies on a cow are 100 flies per side for a cow, and 50 flies per side for a calf. 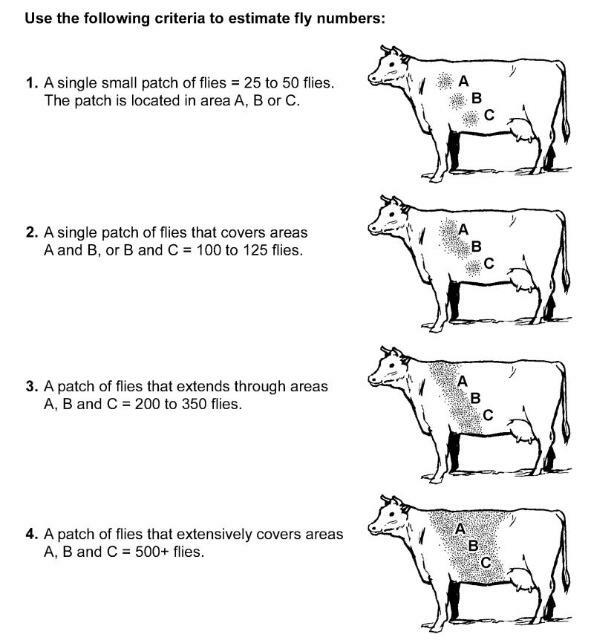 If cows begin to have over 200 flies total (100 for calves) producers will start to see some of these negative impacts and where fly control programs can be so important. Control of flies can take multiple methods but knowing how and where flies prefer to reproduce can be helpful when preventing fly populations from growing. Flies lay eggs in fresh manure where they will then mature and hatch within one week. The larvae will then develop in the manure and then pupate in the drier ground underneath. They complete their development from egg to adult stage between 10 and 20 days depending upon weather. Adult flies can live up to three weeks with normal feeding. Face flies and horn flies can be controlled using a variety of methods including insecticide sprays, back rubbing devices, dust bags, insecticide-impregnated ear tags, and feed-through insecticides. Insecticide ear tags have been used with success over many years. They are most effective when using two tags per animal and applied early in the season and removed at the end of summer as flies can build a resistance to the products used in the tags. Oil-based applicators, pour-on, and direct sprays are also effective methods are more labor and cost intensive. In the end, the producer must decide what is best for their herd. Considerations should be made for facilities and pressure load from pests. For more information, check out this article from the UF/IFAS EDIS page or contact your local Extension office. County Extension Director and Commercial Livestock Agent for Escambia County Florida.